The above chart comes from our August performance analysis [yes, I am a bit behind] and is a scatter plot of Storage Performance Council SPC-2 submissions. In the above we plot MBPS™ on the vertical axis and the number of disk drives in the submission on the horizontal. We have also added a linear regression line using the data with the regression formula listed. Unlike SPC-1 performance results and IOPS™ vs. drives documented in an earlier post, SPC-2 MPBS results have a much wider variance and the regression coefficient (R**2) at ~0.42, shows it. In the earlier SPC-1 post the IOPS-drive count linear regression had a R**2 of ~0.96. 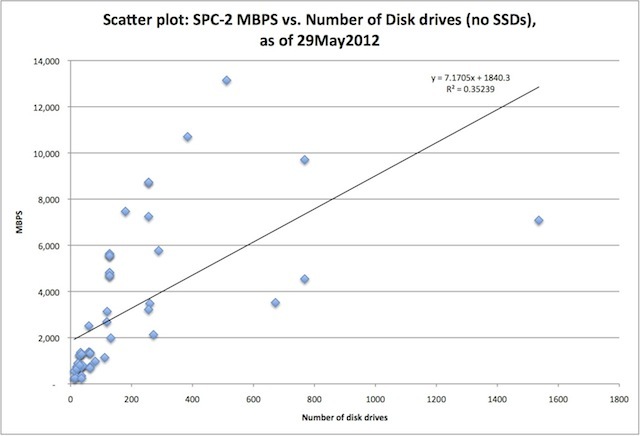 Why would SPC-1 IOPS be more driven by drive counts than MBPS? We can only speculate of course, but it seems to me that SPC-2 MBPS is more a function of system caching effectiveness rather than pure IO transaction speed. All the SPC-2 workloads (VOD, LFP, and LDQ) are sequential in nature and as such, caching sequential lookahead sophistication can make more effective use of fewer spindles. In contrast, SPC-1 IOPS workloads are almost inherently random in nature and as such, are poor cache candidates which by natur depend on high counts of spindles to perform well. In additon, SPC-2 has never been as popular as SPC-1 and as a result, doesn’t have as many submissions. It’s never been clear to me why this is the case as not all enterprise class workloads are random and as such, sequential activity is a necessary requirement for many enterprise storage systems. The complete SPC-1 & SPC-2 performance report with more top 10 charts went out in SCI’s August newsletter. But a copy of the report will be posted on our dispatches page sometime this month (if all goes well). However, you can get the latest SPC performance analysis now and subscribe to future free newsletters by just using the signup form above right. For a more extensive discussion of current SAN block system storage performance covering SPC (Top 30) results as well as ESRP results with our new ChampionsChart™ for SAN storage systems, please see SCI’s SAN Storage Buying Guide available from our website.